The sources of water that feed one of the main ocean circulation systems on Earth are likely to change along with the climate, according to a new study. The Atlantic Meridional Overturning Circulation (AMOC) is an oceanic circulation system that transports warm water northwards through the upper Atlantic until it becomes cold and dense, where it sinks and returns southwards at a lower depth. The AMOC has been the topic of intense study in recent years due to its warming impact on higher latitudes, and scientists are trying to determine if and how it will be affected by a changing climate. But until now, it had been commonly assumed the AMOC’s water sources would remain in place. Yale postdoctoral associate Matthew Thomasis co-author of an Oct. 22 study in Nature Climate Change that sheds new light on the specific regions that will supply water for the future AMOC. 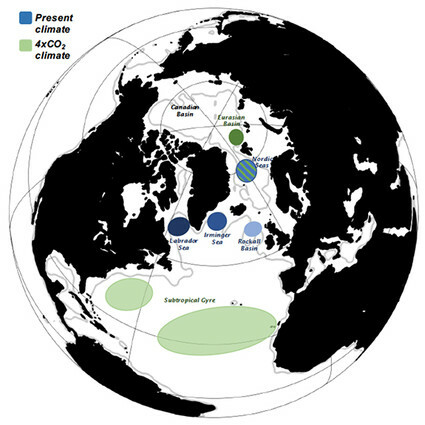 Thomas and lead author Camille Lique of the Laboratoire d’Océanographie Physique et Spatiale said the main sources are likely to shift north to the Arctic Basin and south to the Subtropical Gyre.